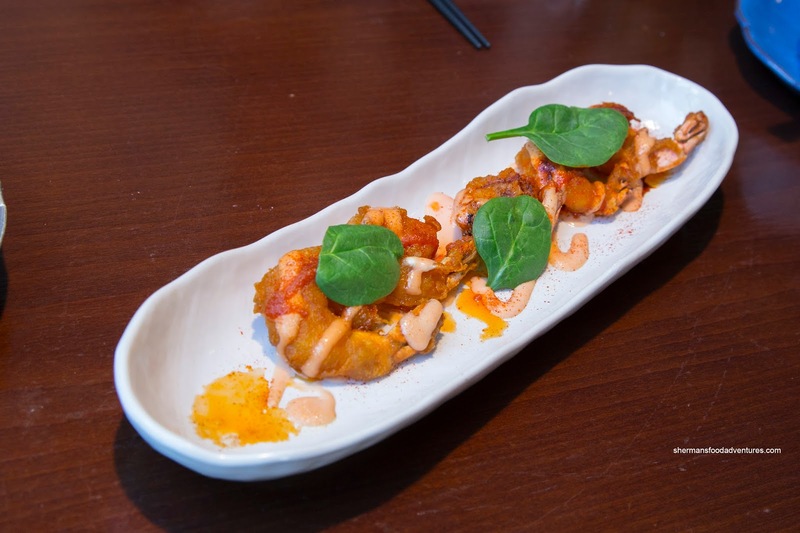 Sometimes our ChineseBites dinners become more like RandomBites (ask Alex Burrows). Let me explain... As much as the overall theme of ChineseBites is to try some of the best Chinese food that Vancouver has to offer, we sometimes stray into other types of cuisines. Call it affirmative action when it comes to our tastings. 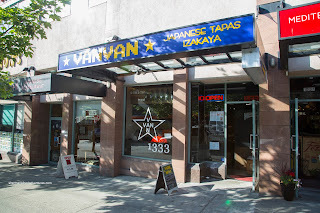 So off we headed to Van Van Izakaya located in the old Maruko Ramen. In addition to a host of other bloggers, I was seated at a table with Eating with Kirby, Amy and Diana. Since we were pretty hungry, we kinda went nuts with the menu. 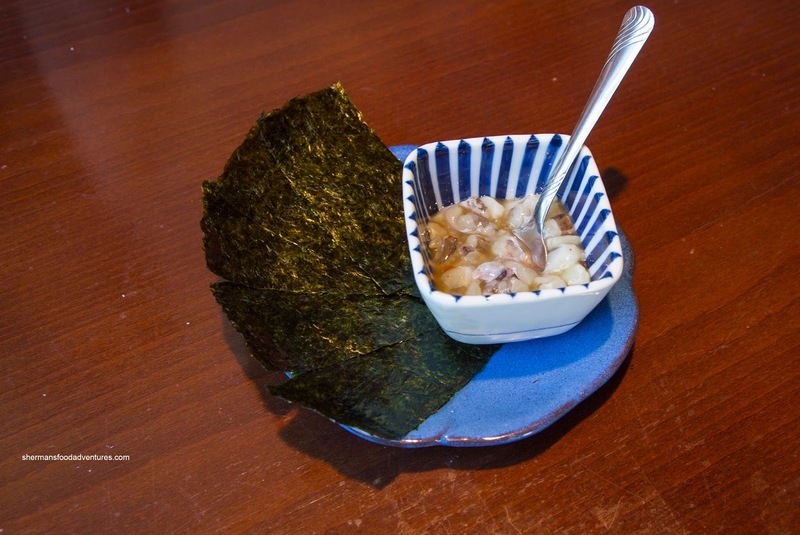 We started slow with the Raw Octopus with wasabi accompanied by nori. 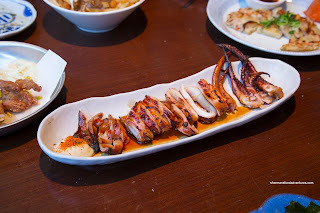 Modest in portion, but appropriately priced at $3.80, the chopped octopus was predictably chewy. However, it wasn't too chewy where there was a slight rebound texture. It was dressed in a good amount of wasabi that led to an immediate hit. There was some natural sweetness to go with the crunchy and tangy pickles. 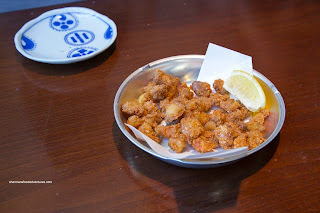 Next up was the Chicken Gristle Karaage (which was actually deep-fried chicken knees). These were fairly small where the overall texture was dry and crunchy. They were tossed in a good amount of salt where some pieces were overly-dressed. Although I've had much better versions of fried chicken knees, I kept eating them for some odd reason. Moving onto one of my favourites at any Izakaya joint was the Ebi Mayo, but in this case, they were called Battered Prawns with garlic chili mayo. As such, I wasn't surprised that they didn't resemble any other version I've had before. These were lightly battered, yet extremely crunchy and firm. 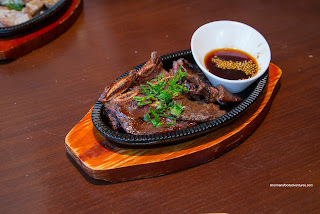 Interestingly, there was a drizzle of chili oil which made the flavours a touch more spicy than usual. Also, there was a smear of sweet balsamic underneath which was didn't really go in my opinion. 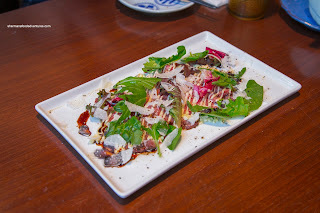 Hidden underneath some greens, the Beef Carpaccio with balsamic reduction, mayo and parm was pretty good. The thin slices of beef were moist and tender while the amount of seasoning was just a tad short. A sprinkle of salt would've gone a long way in making this dish better. We then decided it was time to gamble with our food. No, we didn't order raw chicken or something like that, rather, we had the Russian Roulette Octopus Balls (Takoyaki). 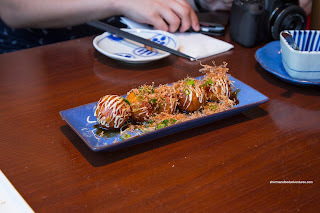 Yup, one of the 5 balls was super spicy while the rest were regular takoyaki. I found them to be pretty soft and loose. They weren't bad per se, but they didn't stay intact either, including the spicy one (which gave away the surprise). 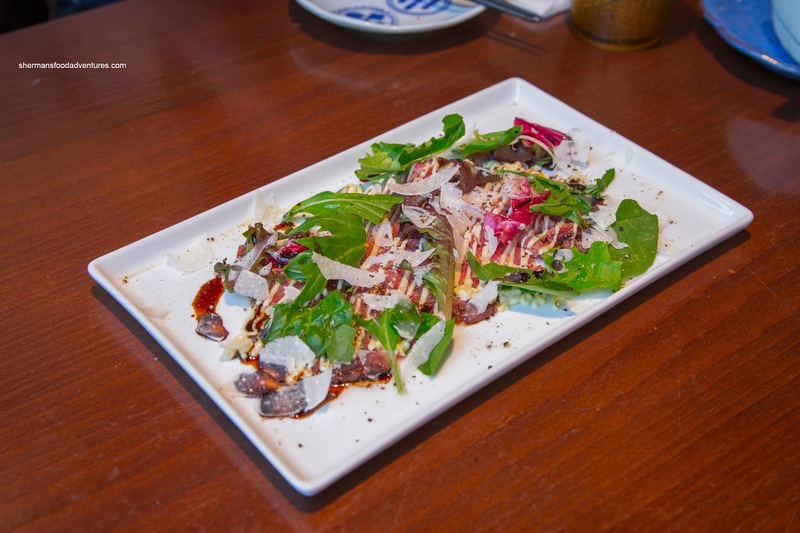 Flavourwise, they were okay with just enough dressing for a sweet savouriness. Arriving in a cast iron plate, but not sizzling, the Beef Shortribs were attractive in colour with some charring. When dipped into the accompanying sauce, there was a good balance of sweet and savoury with a touch of spice. However, the meat itself was a bit chewier than usual. Served on a cast iron plate as well, the Pork Jowl was quite good. 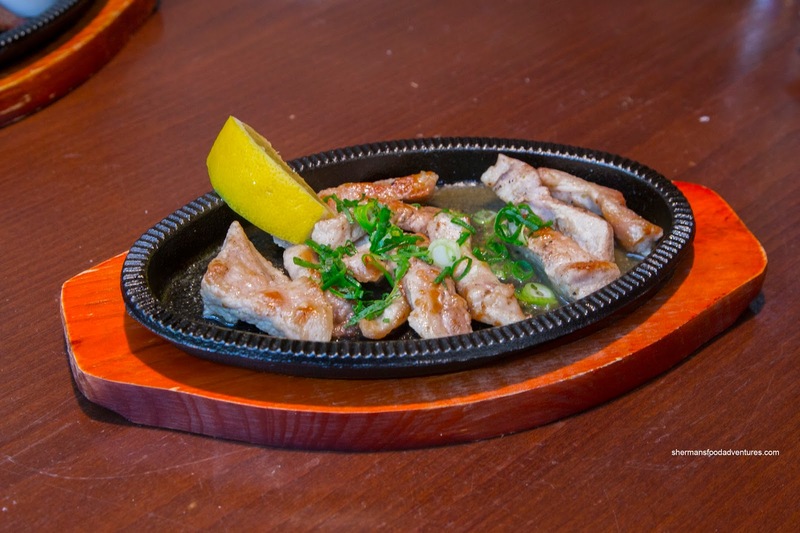 Presented in fairly large strips, the pork cheek retained its moisture where the meat was succulent and had that classic rebound texture. Most pieces sported a nice sear as well. It was mildly flavoured, but benefited from the squeeze of lemon. 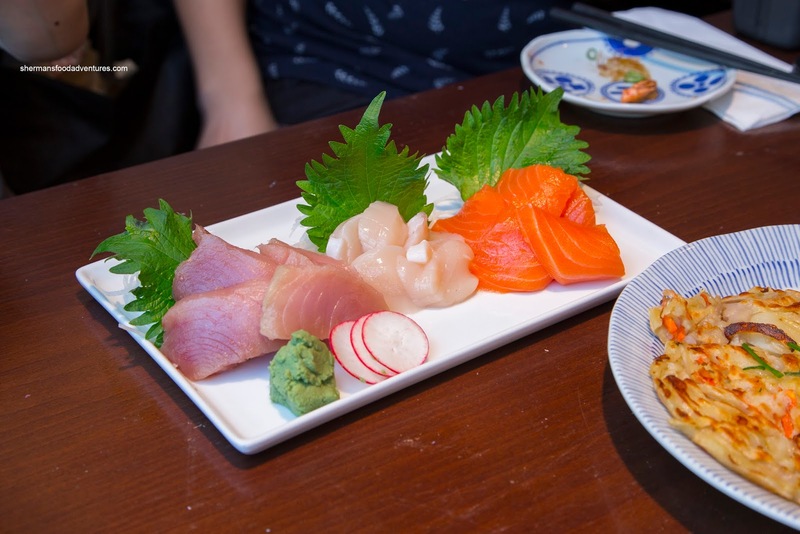 We moved onto the plate of Sashimi next consisting of tuna, scallop and salmon. 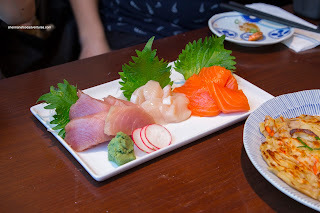 Although not sliced particularly well, the sashimi was decent enough. I thought the salmon was the best item on the plate being buttery with a some chew. The tuna was fine, but cut poorly as some parts were rather jagged. Scallops were okay being soft and naturally sweet. 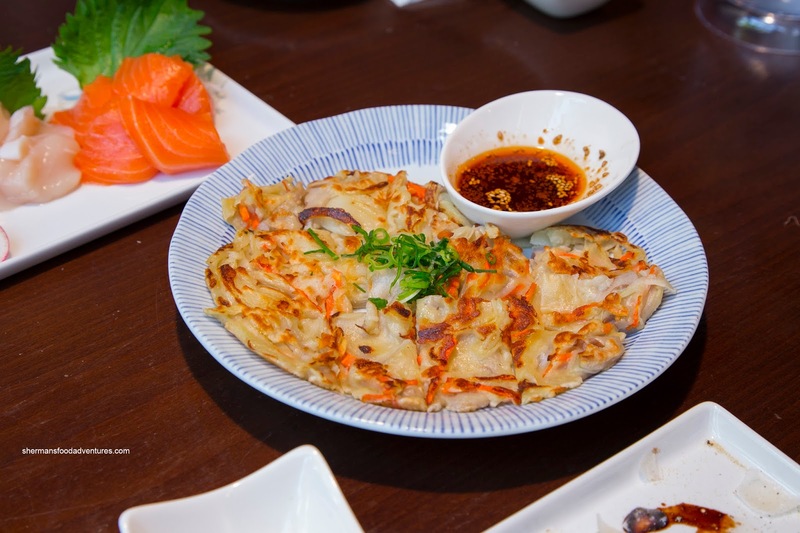 With what was universally agreed as the worst dish of the night, the Korean Pancake was unappetizing. Sure, it wasn't the classic version served in a cast iron plate, but whatever this was, we didn't like it. Despite lacking the grease we normally find in this dish, it was probably one of the main issues. You see, the pancake was doughy, heavy and quite dry. Also, the lack of meat made for uninteresting flavours and texture. On the other hand, I didn't mind the Japanese Pancake as the egg was fluffy and light. 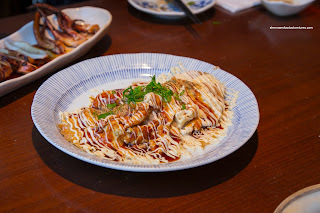 Obviously, it was a completely different style than the Korean pancake, but nevertheless, it was remarkably better. There was quite a bit of mayo on top that I personally didn't mind, but some thought it was too much. 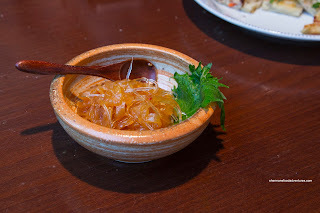 Continuing on with the gluttony, we had a relatively small item in the Jellyfish. Texturally, it was on point being crunchy with only a touch of chew. However, I didn't prefer the consistency of the sauce as it was thick and the whole dish ended up to be clumpy. Moreover, there was too much tang which completely took over the flavour profile. Completely different than the chicken knee version, the Chicken Karaage was quite good. 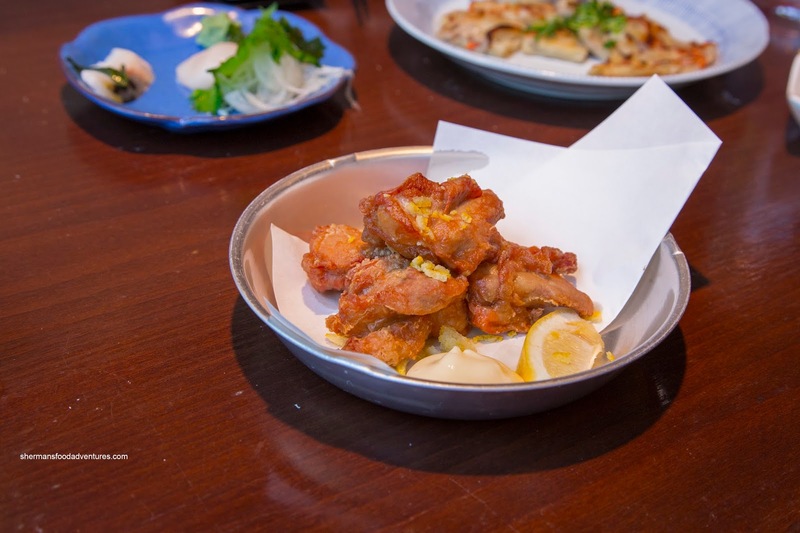 Prepared with large pieces of leg meat, the chicken was succulent and juicy. It was well-seasoned where the mayo on the side wasn't even necessary. Although it looked pretty, the lemon rind bits emitted a rather bitter taste. Despite this, the dish was probably one of the better ones of the meal. For curiousity's sake, we got an order of the Poutine featuring Japanese Curry and melted mozzarella cheese on generic fries. 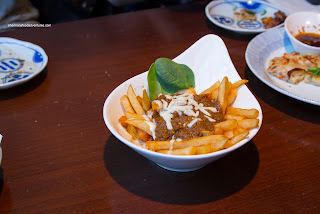 I didn't have a problem with the frozen fries per se (since it would be too much to ask for fresh cut fries at an Izakaya), but they were not crispy enough. As for the sauce, it was sweet and somewhat spicy with a curry kick. It was okay, but missing something. Another solid item was the Grilled Whole Squid with teriyaki sauce. It was attractive and appetizing in appearance. In fact, it ate just like it looked with tender pieces of squid that still had an appealing chew. There was just enough sweet saltiness from the sauce underneath while there was a dollop of mayo on the side. 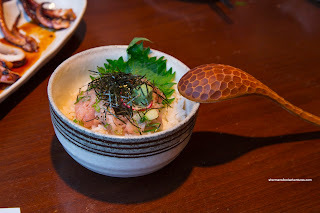 We ended off with 2 of the bigger items including the Chopped Raw Tuna Rice Bowl. I found the rice chewy but somewhat dry. However, mixed in with a splash of soy and tuna, it was fine. This was fairly decent where the tuna was soft and somewhat naturally sweet. Unexpectedly, the Tonkotsu Ramen was acceptable given the venue. 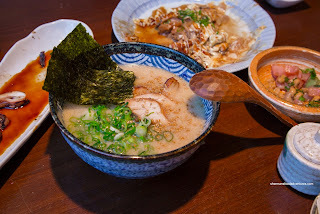 It would have never be confused with the best in town, but the broth did exhibit a creaminess and natural pork flavours. On the other hand, it was strangely clumpy (which lessened the appeal). I found the noodles to be fairly al dente while the large slices of roast pork to be sufficiently tender, if not quite lean. For dessert, we ended us sharing all 4 offerings including Green Tea Soy Milk Pudding, Strawberry Daifuku, Black Sesame Ice Cream and Green Tea Ice Cream. 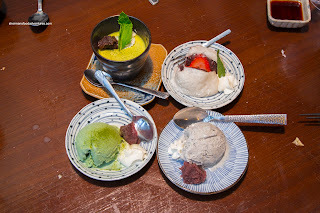 The one I liked most was the pudding as it was light and mildly sweet with the essence of green tea. It was a bit on the thinner side though. Soft and sweet from the red bean, the daikfuku was also quite good. The other 2 were pretty standard versions of ice cream. Since we virtually ate almost everything off the menu, it was pretty clear that it was a hit and miss. 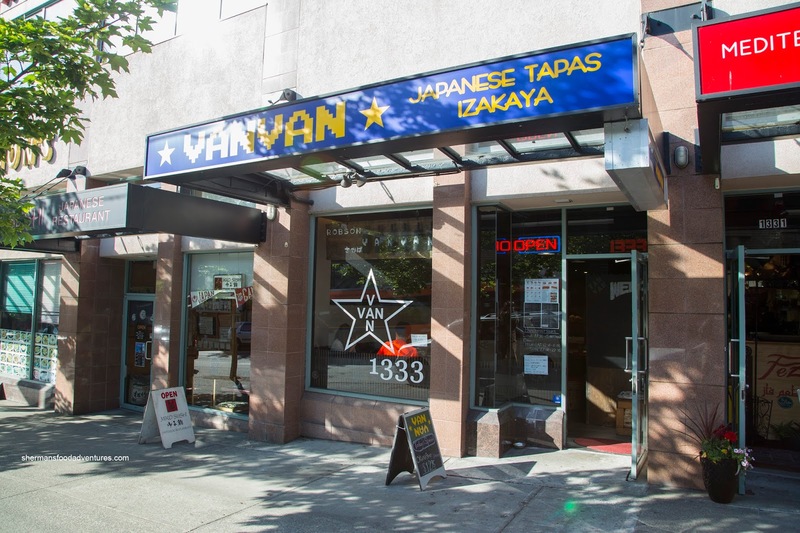 However, with very reasonable prices, VanVan appeals to the value-driven customer.